Success cannot be achieved by a singular moment of inspiration. Success is achieved by discovering and executing on one idea after another, over and over, while having more successful ideas than not. To do this, you need to have a system that when combined with your creativity, insight, and wisdom will produce a predictable stream of great ideas that "moves the needle." The trap we fall into as we seek to achieve a goals is to anchor to a solution. When we do so, our activities and our perception is biased to make sure that idea is "right." Even more challenging is when those we collaborate with are anchored to a solution, which creates an echo chamber of repetition and social pressure that can be difficult to identify or overcome. This system will help you to structure your thoughts, structure team collaboration, and create higher odds of success in new pursuits. Outcomes are the fundamental drivers of your product or business. They are the metrics and measurable goals that you believe best embody success for your product, business, or initiative. Outcomes can be of various levels of specificity or organizational level, but they should represent the output or result metric for your initiative. The outcome is your anchor, it's fixed and the merit of every idea should be thought of and measured against the desired outcome. You know you're doing it right if you have a meeting agenda framed by an outcome. "We are brainstorming how to increase our gross margin on this particular SKU." You know you're doing it right when creative ideas start to flow and when the inevitable arguments for and against occur, that collaborators point back to the desired outcome to ensure the debate remains in frame. Outcomes themselves are great, but if we're looking for ideas it is because something keeping us from achieving that outcome in the steady state of our current activities and product offerings. We must identify the problems that are keeping our outcome from being realized. Creativity and experience comes into play to identify potential problems that block our desired outcomes. Understanding the problem space around the outcome is extremely important to generating good ideas. Ideas are solutions based on solving problems and if we do not have a strong understanding of our problems, we will fail. I encourage you to apply your teams creativity and time to enumerating the problem space around your desired outcome. As you explore the problem space, discuss and brainstorm which problems likely have the largest impact on the desired outcome. 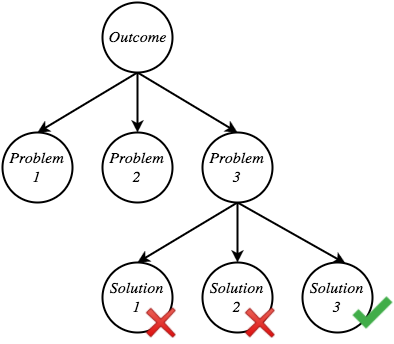 By anchoring around an outcome and having well defined problem statements you will have the correct context for the actual, and final, ideation phase. Solutions are ideas that we will implement and validate. The anchor of your outcome and a strong and complete list of problem statements are the context you need to not only generate ideas, but to meaningfully debate ideas, and measure their efficacy. Now we can begin the exercise we may have been accustomed to starting with when ideating. Now is the time to look at your outcome and problem space and be inspired. There will be obvious ideas (great! ), there will be hidden and unconventional ideas, there will be non obvious approaches. This is the time to generate your list. Once you have your list of ideas that solve the problems that block your desired outcome it's time to rank them. Discovery, debate, and measurement based on experience, research, and experimentation will help you to select and implement ideas that are relevant and have the risk-reward payoff. A great idea alone will not breed success. A system that generates great ideas over and over more frequently than not is a requirement for success. We cannot depend only on multiple lucky strikes. Use this system to generate meaningful results in your job. Also use this system to lift others, as you now have a framework to work backwards from a solution. People often share ideas, not the problems or outcomes they are working on. It's impossible to judge an idea if you don't understand the problem it solves and the outcome it seeks. So now, when someone approaches you with an idea you can ask about the outcome being sought, the problem the solution overcomes to achieve the outcome, and what alternative problems and solutions were (or were not) considered. Hopefully the systematic evaluation of ideas lifts us all. You will often find me with a grid line notebook and drafting pencil working through product concepts, exploring problem spaces, and toying with novel business models. The modern Product Manager role can be traced through a chain of events starting in the early 20th century when an enterprising young economist asks, "How can I sell more soap?"